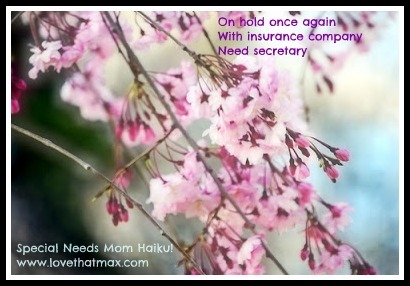 Love That Max : Special Needs Mom haiku! Will he get more therapies? OK, your turn—share your Special Needs Mom haiku here! You know the pattern: 17 syllables in lines of 5, 7, 5. I'm telling you, they're amazingly zen to write. What is that bald spot?! Why do I keep reading blogs? I want to make it better. But, we can't go now. Days smiles, me and you. LOVE these. I think we need a Haiku Festival or something. So much fun...must try another. had to force the 7 syllables there! What will it be like for her? My friends can do it. But I need more time to learn. I dont want to read books written by "experts". My girl has a rare type of CP.